Laurence Skelly (Past President), Kelly McCarthy (2nd Vice President) with Mike Corlett and Ivor Ramsden of the Museum. On February 7th, the North American Manx Association (NAMA) presented a special U.S. flag to Ivor Ramsden of the Manx Aviation and Military Museum at Ronaldsway. The story behind this presentation dates back to a tragedy that occurred in 1945 and is marked each year by a pilgrimage up North Barrule. Boeing B-17G Flying Fortress number 43-38856 was one of 13,000 built at the Boeing factory in Seattle, Washington. Following completion and flight-testing the aircraft was delivered to the United States Air Force on 30th September 1944. Next month the B-17G flew the 3,000 miles North Atlantic supply route from Maine via Greenland and Iceland to arrive in the United Kingdom where it was assigned to the Eighth Air Force, 381st (Heavy) Bombardment Group, 534 Squadron, based at Army Air Force Station 167, at Ridgewell, Essex. Missions carried out by the 381st while this B-17G was with the group were varied. During the German offensive in the Ardennes (the Battle of the Bulge) in December 1944, the 381st struck at airfields and communications in the battle zone. In March, 1945, the group provided air support for the Rhine crossing and then operated in the final push through Germany. Towards the middle of April 1945, the talk at Ridgewell was of the war coming to an end. Operations though, were still being flown and from April 9th to April 21st the 381st flew ten combat missions, all deep into Germany. From all ten missions all aircraft returned safely. On Monday 23rd April, 1945, just two weeks before the end of the war, no operations over Germany were planned for the group and a flight was organised to take a group of servicemen from nine different units on a week’s leave to Northern Ireland. The men chosen for the leave were the support servicemen, the ground crews, armourers, mechanics and fitters. These were the people who kept the aircraft flying, combat-ready and safe. Some of these men had been at Ridgewell since the 381st arrived in June, 1943 and for most this was their first real break. That morning their B-17 flew into the side of North Barrule killing all 31 personnel in the worst air crash the Island has ever seen. The men were buried on the 27th of April 1945 at the American Military Cemetery at Madingley, near Cambridge. Fast forward to 2010: the Society’s American flag was becoming severely weatherbeaten due to the high winds which scour the hillside and reports from the Isle of Man about its condition reached the North American Manx Association (NAMA). An immediate Board vote was held to purchase a new flag to honour the fallen airmen. Kelly McCarthy, 2nd Vice President of NAMA and one of the island’s worldwide network of Honorary Representatives, arranged with her U.S. 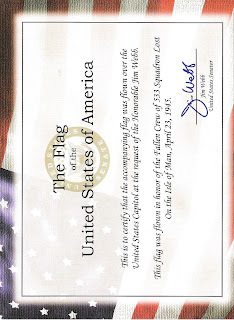 Senator to acquire a flag that had been flown over the Capitol Building in Washington D.C. A fitting tribute to the men who lost their lives in service of the United States. The Manx Aviation and Military Museum is located at the edge of Ronaldsway airfield on the main Douglas to Castletown road and is open Saturdays, Sundays and Bank Holidays from 10am to 4.30pm. Special tours can be arranged on request. 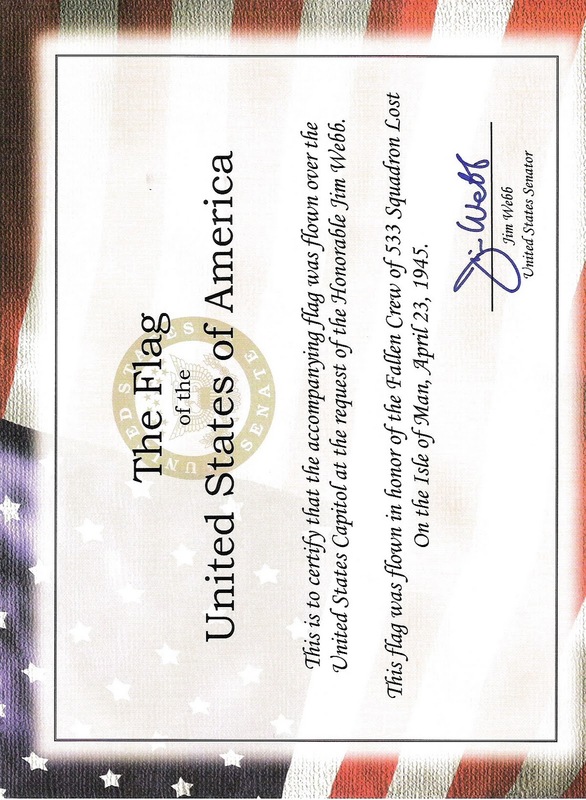 Certificate certifying the flag was flown in honor of the flight crew over the Capitol Building.